The Preschool Department held the annual celebration of Nutrition Month with the theme, ―Healthy Diet, Gawing Habit for Life‖. Throughout the month, students are tasked to bring fruits or vegetables as they meal during their recess time to encourage children to increase their vegetables and fruits consumption as part of a healthy diet. To highlight the celebration of the Nutrition Month, the Chairmen of the event conducted the culminating activity for each level. All pupils were engaged with a mass exercise at the beginning of the program, followed by the film viewing and video presentation. The children had so much fun watching their video. The assigned chairman for each level prepared different activities. 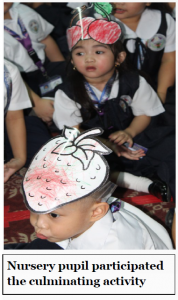 Miss Charmaine D. Mañibo, led the making of ―Rainbow Fruit Skewer‖ for their active Nursery pupils, ―Fruit Art Activity‖ was made by the artistic Kindergarten headed by Miss Melinda V. Paguia, ―Fruit Sharing‖ for our generous Preparatory Level guided by Miss Edna R. Mendoza. The following activities were held inside their respective classroom last July 7, 2017. Miss Phides Fay Cuntapay, the Preschool Department Head, reminded the children the importance of having a healthy diet in life by eating fruits and vegetables. The celebration was held at the Corniche Hall, Building A in their respective timings last July 31, 2017.